Monday February 21st 1881 I hurried through with my work this morning and went to town before dinner Was at Wins a little while. I worked all the afternoon on a heathenish mat I have undertaken to make but gave it up in disgust and knit all the evening. Tuesday February 22nd 1881 I helped with the work and knit what spare time I had afternoon and evening Weather unpleasant another squall of snow Mother was over town in the afternoon. 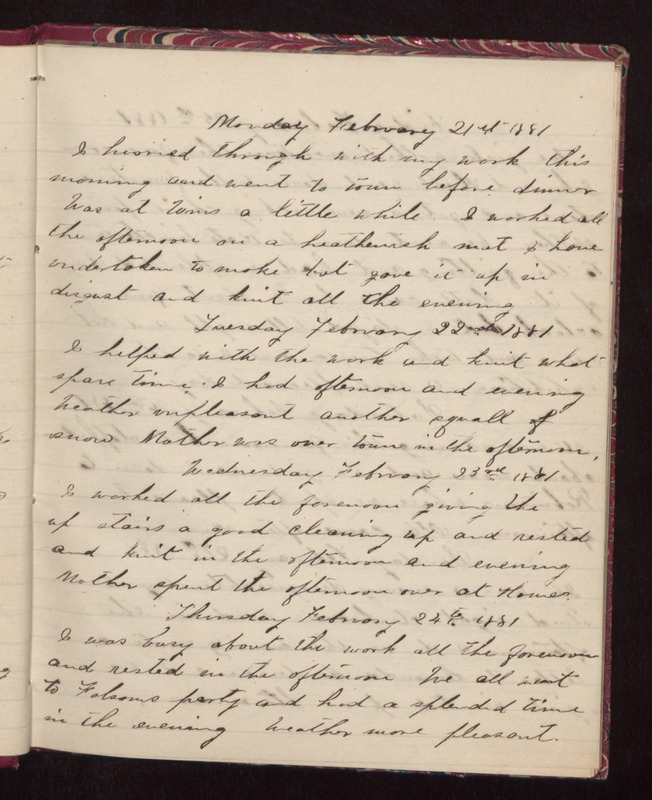 Wednesday February 23rd 1881 I worked all the forenoon giving the up stairs a good cleaning up and rested and knit in the afternoon and evening Mother spent the afternoon over at Howes. Thursday February 24th 1881 I was busy about the work all the forenoon and rested in the afternoon We all went to Folsoms party and had a splendid time in the evening Weather more pleasant.